The National Grits Festival is back! After several years without the festival, it’s back and will be held on April 8th in Downtown Warwick. 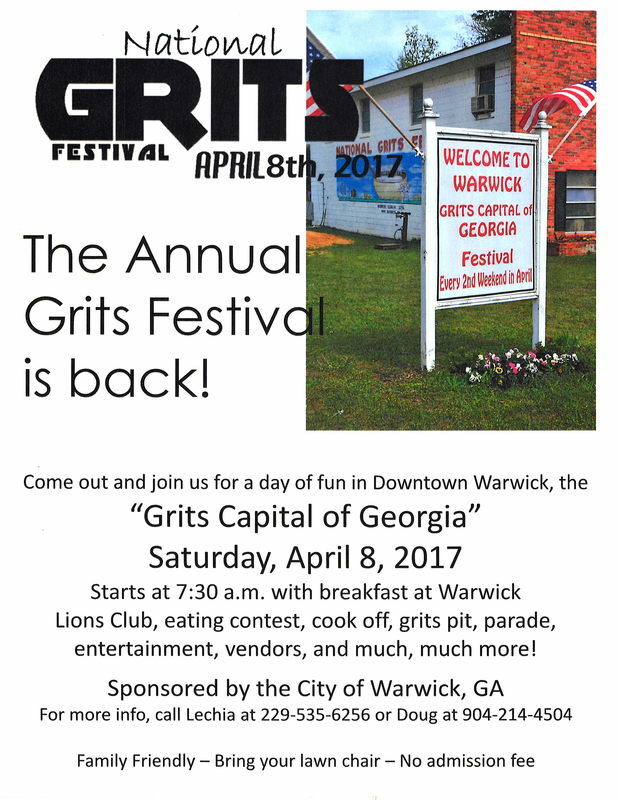 Activities include the grits cook off, grits eating contest, parade, and the grits pit. To be a sponsor, vendor, or participate in the cook off, contact Lechia at 229-535-6256 or Doug at 904-214-4504. “Share the Gift of Christmas” Parade starts at 6:00 pm and there will be entertainment at the Train Depot on Front Street afterward. Santa will also be there to take pictures. The parade is sponsored by the City of Sylvester, The Downtown Development Authority and Downtown Enhancement. Find out who is protecting you, and how you can protect yourself. Community involvement connecting, communicating, and collaborating with local law enforcement for a crime free place to call home. Hosted by the Sylvester Police Department, with many area law enforcement and civic organizations participating.